With just a dozen horses in work, trainer Scott Spackman is rightly proud of his achievement to have a likely three runners in Sunday’s SDRA Country Championships Qualifier (1400m) at Wagga Wagga. He’s not a full-time trainer as he works at a school in business hours in ground maintenance and as an agricultural assistant so relies on his team to fill in the gaps. 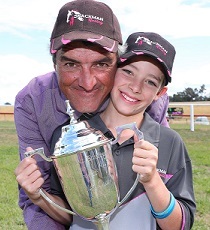 Scott Spackman and son Oliver celebrate Didn’t Even Kiss Me’s Tumbarumba Cup win. (Pic: Daily Advertiser). Progressive mare O’ So Hazy (by O’Lonhro), along with last start winners Didn’t Even Kiss Me and Chastity Strikes give him confidence he has his best chance since the inaugural series to represent the Southern Districts in the Final at Randwick. “It’s been stressful but everything has gone to plan to be fair,’’ Spackman said. “I am so proud of my staff. I’ll be a blubbering bloody mess if we happen to pull it off. “It’s so important to have the right people around you in this game. And it is a game, I run it as a business but it is a game. Back in 2015 Spackman qualified Yet Tobe Convinced and he admits it was all a bit of a blur. The mare ran second to Loved Up in the Qualifier at Wagga then finished seventh in the Final behind Artlee – that year the first day of The Championships was washed out and postponed by two days and the horse had to travel between Sydney and Wagga twice in three days. “That was a good coup, I was pretty proud of myself there,’’ he said. “It was the first year and I ran into a good horse called Loved up. We finished alongside each other in the final but it did knock her about. To get her there took everything out of her. O’ So Hazy has won four of her nine starts and proved to Spackman with her last start third at Canterbury that she’s a horse with a future. After being involved in an early speed battle she had the audacity to fight on for the minor prize and returning to her home track, where she is unbeaten, is a plus for her. “We’ve done it our way with O’ So Hazy. The idea of taking her to Sydney was to find out how good she was and I think we found out she’s pretty handy,’’ he said. “They ran along in that race and she fought on very well. I was expecting her to give it up at the 200m, she was entitled to. “That’s the first time she’s been to town, she did it all in the one day and she’s recovered very well from that. As Spackman alluded to, Didn’t Even Kiss Me ran in last year’s Qualifier at Albury but finished well down the track. She’s a mare the trainer has plenty of time for, she’d contested a Group 2 race first-up in that preparation, but has taken the low road to the Championships this time around with wins in the non-TAB Tumbarumba and Tumut Cups. Aaron Bullock rides Didn’t Even Kiss Me and it’ll be the only time he’s ridden for Spackman in the more than four years since they combined to win at Wagga on Australia Day in 2014 with Romancing To Win. “We gave her those Tumba and Tumut Cups to get some confidence in her. The last win was 6-1/2 lengths and great time, and times don’t lie,’’ he said. “I was talking to Aaron the other night, he didn’t realise Didn’t Even Kiss Me won the Tumut Cup and he said if he knew he would’ve gone to ride her because that’s on his bucket list. O’ So Hazy is one of Scott Spackman’s three Country Championships contender. (Pic: Bradley Photos). Bullock has ridden in two of the three Qualifiers so far and finished second on Awesome Pluck in the Mid North Coast heat two weeks ago. As for Chastity Strikes, the trainer said the former Kris Lees-trained mare is getting used to some personal attention in his small team since being transferred in June last year. 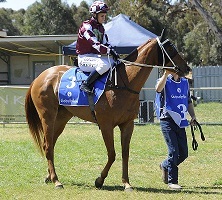 He feared he would run out of time to qualify her after she was scratched at the barriers from a race earlier this month but she bounced back with an easy win over 1200m last Thursday. “Chastity Strikes was a bit of a dicey one because we were scratched at the barriers then had to retrial and win that last race, not so much to guarantee a run but to hopefully get her in,’’ he said. Jay Ford has the ride on Chastity Strikes while Brooke Sweeney continues her association with O’ So Hazy on Sunday. Spackman will run stablemate Takookacod in a 1000m Class 3 instead of the Qualifier. As is the norm, first and second from the SDRA Qualifier will earn places in the $500,000 Country Championships Final (1400m) at Randwick on April 7.